Brittany Snow, William H. Macy, Tom Lipinski et al. 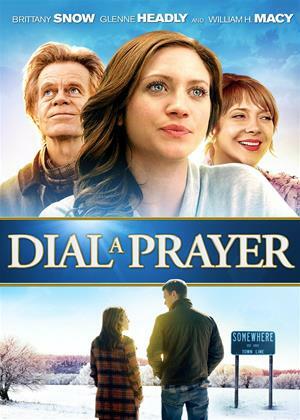 In 'Dial a Prayer', Cora (Brittany Snow), a disenchanted and troubled young woman, begrudgingly answers phones at a Prayer Call Center under the watchful direction of its religious leader Bill (William H. Macy). When her prayers start making a difference, one caller shows up convinced he’s been saved by her voice. With the discovery of her newfound gift, Cora struggles to reconcile her troubled past and grapples with the faith that others have started to show in her. After experiencing a plethora of religious based movies in 2014 that were all hokey productions of an us-versus-them mentality, it’s refreshing to see something so different and moving as Dial a Prayer. You may see the synopsis for this movie and believe you have it pegged. A drug user who busts up a church is sentenced to answer phone lines for prayer organization. She starts off bitter and hostile towards the cube life of constantly talking to people about God throughout the day, but will soon learn to take something away from this experience. In the hands of the usual flock of flawed Christian filmmakers, she would be going to church, singing choir and eating lemon bars by the end of the picture. Writer/director Maggie Kiley thankfully sidesteps choosing a side to favor propaganda and creates a more personal and relatable tale about one woman trying to get her life together. It helps that the character of Cora (Brittany Snow) is established as a fully realized character. She’s young, bitter, rebellious and confused about what she wants out of life. She breaks statues at a church and only after the moment she sets it on fire does she realize how terrible she has become. Her time at the Dial a Prayer center is, of course, a terrifying experience at first. The christian co-workers and high-spirited minister boss Bill (William H. Macy) come on far too strong. They all show tremendous value in their work and take pride in their celebrations of holidays and volleyball. They are everything that Cora is not. She cannot relate to the hefty binders for codes of prayer and is terrible at their caller training exercises. It doesn’t take long for her to cling to the release of drugs once more. Even with her prying mother, Cora still has some hope mostly because she wants to do better. There is guilt in her heart over what she’s done and the people she has affected. There is something in her that may not want to go full-on Christian, but at least better herself as a human being. And this is where Dial a Prayer finds its stability as a personal picture that favors neither the righteous path nor deeply mocks those who follow it. When presented with an amazing gift for listening to prayers and helping people, Cora tries to find her own way to proceed with her life. It also helps that her life isn’t entirely filled with one-dimensional stereotypes. Her boss is all about spirituality and comradery, but not a savagely corrupted soul blinded by faith to see what’s in front of him. Though highly involved with his work, he’s not deaf to what Cora both wants and needs out of her life. Her co-workers range from various degrees of loyalty of airheadedness, but she does manage to find friendship in one that seems to be balanced enough at reading and relating to others. There’s even a love interest in her life with some real emotion and pathos rather just being the perfect man required for our leading lady to be happy. That being said, the movie doesn’t shy away from going a little darker down the various gradients of faith. We see the ultimate form of the obsessed Christian - large in weight and overly enthusiastic about prayers and quotas. We see the ultimate form of the raging atheists - a bad blood who applauded Cora for destroying the church and everything it stood for. Both appear as examples of the edge that Cora teeters and not much else. Still, it helps that there isn’t an overabundance of these types of characters as most of the Christsploitation films tend to favor. Dial a Prayer is a genuine surprise as a spiritual film that walks a delicate line between propaganda and satire, never falling into the pit of either. You care about these characters and can relate to them as more than just puppets for an ultimate message. While it does peter off towards the end, it was still pleasant to see a movie where spirituality is treated with a more mature and thoughtful presentation. It’s just a shame it’ll be shunned by atheists for its title and despised by Christians for its adult content. For that I fear that a film such as this will probably not get the attention it deserves for refusing to be more tribal. One can only hope that its solid acting and direction will please the rest of the audience in the middle.